Kebab’s are perfect evening snacks and we make it quite often at our home. I generally prefer to make it at home because I can add a lot of healthy ingredients which are at times missed when we eat outside. Of course, there is no compromise on the taste and I also get the flexibility to adjust the spice level based on individual needs at home. The one which I have mentioned below is a medium spiced one with vegetables, mix of pulses and bread added for binding. Make sure to have a good chutney to enhance the taste - preferably mint & coriander chutney. You may try out the grilled version in microwave, though I am not sure about the duration it needed. I have tried pan fried but it doesn’t seem to be as crispier than oven version. 1. Soak the dal for 8hrs, boil and mash by removing the excess water. You may mash the dal in the mix by draining the water. 2. Powder the bread by grinding in a mixer. Chop mint and any other leaves included for the vegetables. 3. Mix all the ingredients except lemon, oil. 4. Squeeze the lemon at the end. 5. Take a 6 medium size bamboo skewers and soak it in water for an hour. This is needed else the sticks will burn. 6. Take an oven tray and cover it with aluminum foil and brush with oil. 7. Start binding the mix with the stick and place them into the tray. Initially it might not bind completely but do not worry it will become stiff once you put into the fridge. 8. Brush with oil on the top part. No need to brush at the bottom part as we had already brushed the tray. 9. Refrigerate for minimum 1hr in fridge or freezer. I generally prefer freezer if have only 1hr time. Otherwise sometimes I make this in the morning and put it in the fridge (Non freezer) section. 10. Pre heat the oven for 180 degrees for 5 minutes. Place the tray. After 20 mins keep checking if the bottom portion of kebab is cooked. If its cooked and crispy turn around. If needed you may brush the oil , otherwise it should be just fine. Kebab is ready !!! 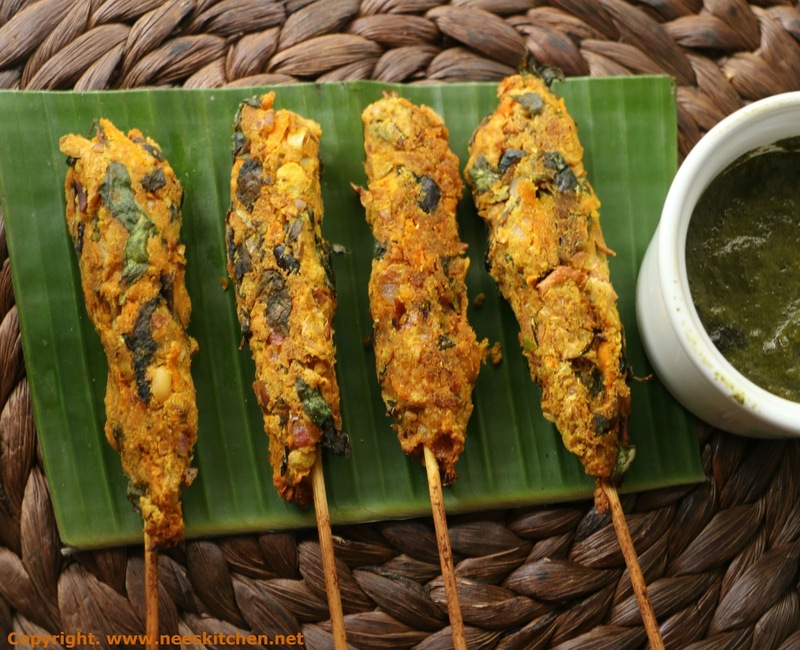 Serve it with mint coriander chutney , lemon & onion wedges. The measurement is based on the mashed dhal quantity as different types of dhal would give different quantity after boiling. I used 1/2 of pulses mix to get this measurement. After the dhal is boiled, make sure you strain the water completely and mash it. This is important else the kebab cannot bind. You may wish to add 2 breads if you are not very confident on the binding part. Oil mentioned in the ingredients is only for brushing. You need not add it while mixing. You may wish to omit vegetables and use only dhal. I am posting the burger patty in this way in the coming weeks. I have omitted ginger garlic paste as my kebab powder already has it included. If your masala does not have ginger garlic paste make sure to add them. Some kebab mix has salt added to it, so make sure you add the right amount of salt. If you wish to add potatoes, make sure you boil and mash.All vegetables must be very finely chopped. 1. August 2016 - Baked Kebab wins first prize in Archana's Kitchen Eggless Baking contest. 2. June 2016 - Baked Kebab wins consolation prize for the facebook contest conducted by Krispy Kadai in association with Snalthy foods. You may see via the following hash tag ‪#‎HealthySnalthy‬.